De CSS code is de officiële publicatie van de IMO over het laden en vastzetten van lading aan boord van zeeschepen. Recognising that improper stowage and securing of cargoes has resulted in numerous casualties, not only at sea, IMO has developed the Code of Safe Practice for Cargo Stowage and Securing to create an international standard in this area. 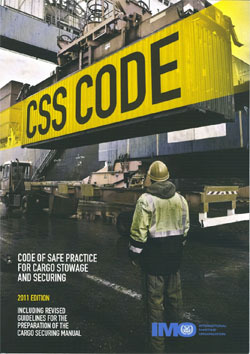 The Code provides general principles for shipowners and operators to minimise risk, offers advice on equipment and techniques, details cargoes known to create hazards and difficulties, and advises on actions to be taken in heavy seas and to remedy the effects of cargo shifting. This edition includes various IMO resolutions, circulars and guidelines relevant to the field of cargo stowage and securing. The Code was adopted for the first time in 1991. The 2011 edition of the Code of Safe Practice for Cargo Stowage and Securing (CSS Code) incorporates all amendments up to and including 2010. MSC.1/Circ.1353 introduced a new annex 14 on Guidance on providing safe working conditions for securing of containers on deck, in June 2010.